Like I have said before, I love the mini Cadbury eggs. I try not to buy them very often because I am pretty sure I could polish off a bag all by myself. They are also my husbands weakness. So when ever I do buy them, they don’t last very long. This chocolate cookie recipe is the recipe I used for the chocolate orange cookies. If you haven’t tried those, you really need to! I left out the orange extract and orange zest and added some Cadbury eggs to the top of each cookie. 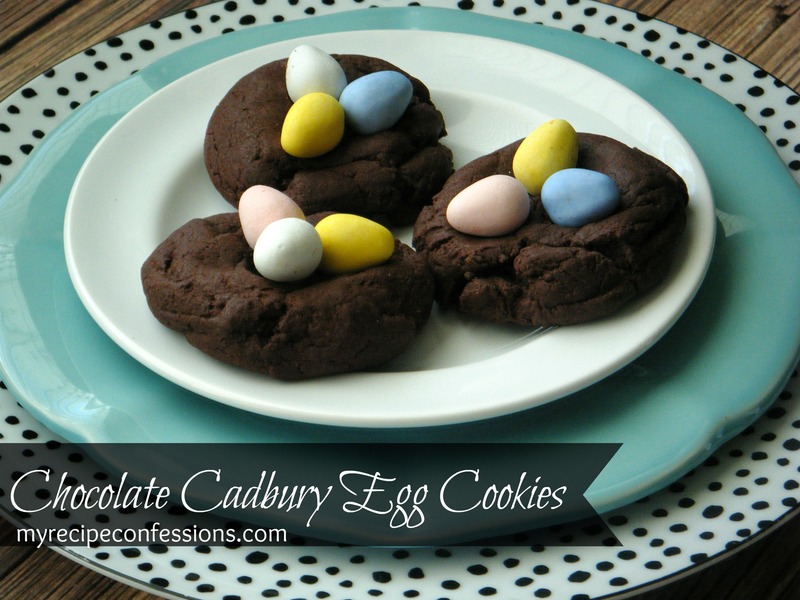 In addition to the wonderful taste of the Cadbury eggs, these cookies are so moist and creamy! The only problem that you will encounter is trying to limit yourself to just one. 1. In a large bowl, cream the softened butter, eggs, and granulated sugar together. Add cocoa powder, and vanilla extract to butter and mix until well combined. 2. Mix all the dry ingredients in a medium sized bowl. Add the flour mixture to the chocolate mixture. Mix until well combined. Fold in the milk chocolate chips. 3. Drop 1 tblsp. of cookie batter onto a prepared cookie sheet. Bake for 6 minutes, place three Cadbury eggs on the top of each cookie. Bake the cookies for an additional 4 minutes. *You don’t want to over cook these cookies. Remember, there will be some carry over cooking. If you over cook the cookies they will be dry.